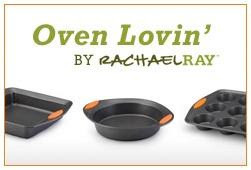 Okay, I was going to call bullsh*t when I saw that Rachael Ray now has a set of bakeware called Oven Lovin', because she is a self-professed non-baker. However, after further thought and a quick review of the products, I think Rach has a good idea with these! How can you have Stuffin' Muffins with no muffin tins? How can you have Oven Steak Fries with no cookie sheet? How can you have meatloaf with no loaf pan ? I couldn't exactly think of a justification for the cake pans, except Rach's magazine has tons of great dessert recipes from contributors.... And imagine what Rach can do with a mini muffin pan. I'm looking forward to seeing her utilize that one in the near future (can't you just hear her telling the audience that they can conveniently pick up her mini muffin pan?). The kicker is that according to the product description on Amazon: "A portion of the proceeds from this purchase will be donated to Yum-o! to empower kids and their families to develop healthy relationships with food and cooking. http://www.yumo.org/." Nice work, Rachael! As I think that it is good to use with oven.